A Special Police Officer (SPO) was injured on Friday evening as Pakistani troops resorted to unprovoked heavy shelling and small arms fire along the Line of Control in Jammu and Kashmir’s Poonch district. Identifying the injured SPO as Syed Shah, sources said the cross border shelling started in Shahpur and Kerni sectors late Friday evening. The Pakistani troops were targeting forward Indian positions and civilian population at various places along the LoC including Kerni, Shahpur, Qasba, Gountrian etc. The injured SPO was hospitalised. Meanwhile, a defence ministry spokesperson Lt Colonel Devender Anand said that “Pakistan initiated unprovoked ceasefire violation by heavy shelling with artillery and firing of small arms along the LoC around 6 pm.” The Indian army was retaliating strongly and effectively, he added. Meanwhile, Border Security Force apprehended a Pakistani national along the International Border in Ramgarh sector of Samba district. He was arrested while moving under suspicious circumstances near Balard post, sources added. Ever since Indian Air Force struck terror camps in Pakistan occupied Kashmir last month, there has been a spurt in incidents of cross border shelling along the LoC. On Wednesday, students and staff of a state government-run middle school in Jammu and Kashmir’s Rajouri district had a narrow escape for the second day on Wednesday when they got trapped in Pakistani “artillery” shelling and small arms fire along the Line of Control in Nowshera sector. 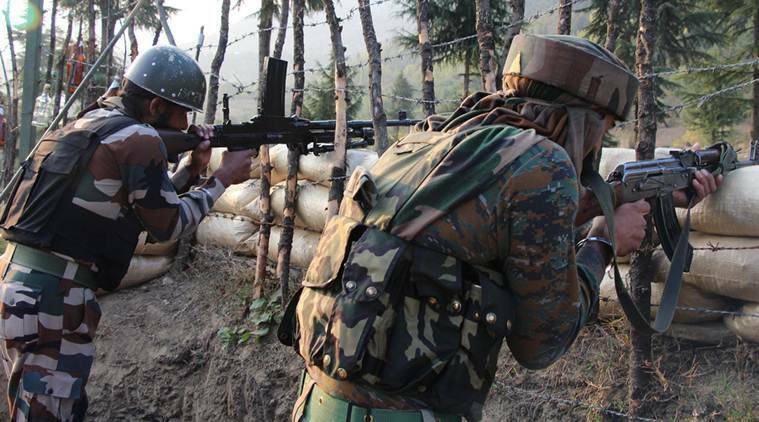 An Army personnel was injured in Pakistan shelling in Nowshera sector on Tuesday. In Poonch’s Krishna Ghati area also, they had restored to heavy mortar shelling targetting forward Indian positions and civilian areas. Four civilians have so far died and nearly 15 others injured in unprovoked medium artillery and mortar shelling by Pakistani troops during the last ten days. Significantly, Army Chief General Bipin Rawat had paid a two-day visit to various forward areas in Jammu on Saturday and Sunday to review the operational deployment and preparedness of troops. During his visit, he interacted with officers and jawans to review the situation on the ground. He was briefed on Indian Army’s calibrated and effective response to ceasefire violations by Pakistani troops.